Here’s another data point to consider amid all this supply chain chatter about just how Apple is managing production of its new iPhone 5c and iPhone 5s. Société Generale analyst Andy Perkins on Monday upgraded his rating on Apple’s shares to “buy” from “hold.” His rationale for doing so: Hon Hai and Pegatron, two of Apple’s iPhone manufacturing partners, charted a 20 percent year-over-year increase in sales during September. 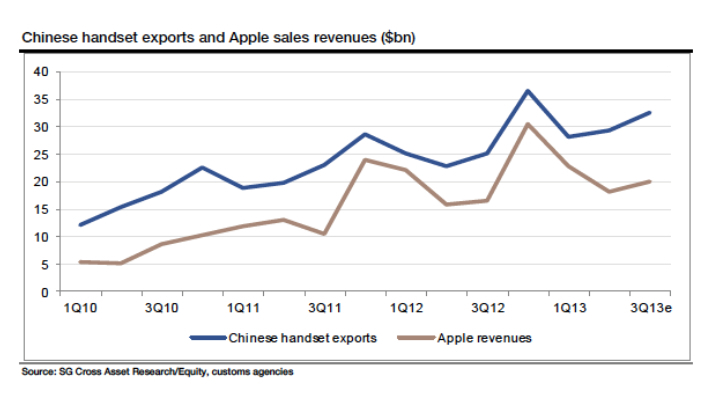 And at the same time, the value of handsets exported from China, where most of those companies’ iPhone facilities are located, rose 30 percent. With that in mind, Perkins raised his target on Apple shares to $575, arguing for “strong rises” in sales of the company’s new iPhones. “For now we believe that the momentum is with Apple, especially its new 5s model,” he wrote.